Order - Reveal the top card of an opponent's deck. If it is not a personnel, place it on the bottom of its owner's deck to make this ship attributes +2 until the end of this turn. You may do this only once each turn. "How am I supposed to be 'creative' with a 39-year-old rebuilt engine?" 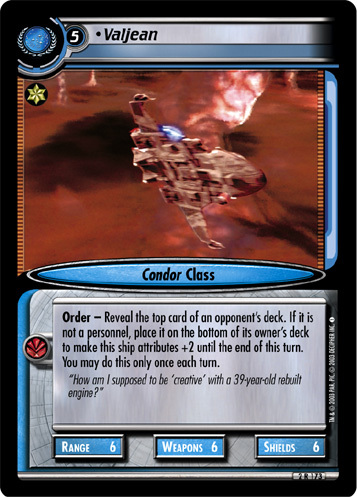 Characteristics: affiliation, enhance your ship attributes (this card), manipulate opponent's deck, Maquis related. There are 17 entries for Valjean (ST2E 2 R 173) at the Tradeplace (11 haves and 10 wants). Click here to see all trade list entries for this Rare card!